Last month I had the opportunity to visit the Children’s Surgical Centre, along with a few other members of the White Collar Boxing squad. In three whirlwind days we went on rounds with the doctors, asked a ton of questions, and observed several surgeries at the CSC. We also fit in visits to the Killing Fields and Tuol Sleng Prision, where many of the more than 3 million victims of the Khmer Rouge were tortured and killed. While it wasn’t my first time in Cambodia or Phnom Penh, it was my first time visiting anything like the CSC. 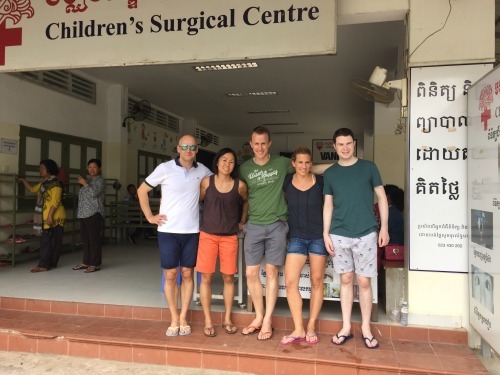 Seeing first hand the type of medical work that I’ve so often heard and read about, meeting some of the patients, and putting it all in the historical context of Cambodia’s recent past gave me a far greater appreciation for why the CSC was founded and how greatly it impacts the lives of those it serves. Before I go on to recap our visit, it might be helpful to provide a little more background on the CSC itself. 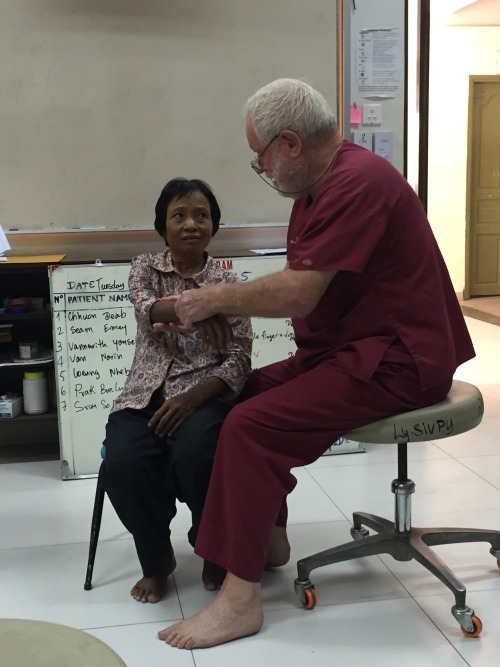 The CSC was founded in 1998 by Dr. Jim Gollogly, who first visited Cambodia in the early 90s on a short-term assignment for the American Red Cross. The country had been decimated by the Khmer Rouge – generations of Cambodia’s best-educated scholars and professionals had been rounded up and killed, leaving an undereducated population with few qualified doctors, a medical system that was severely lacking, and a large number of uncleared land mines scattered around the country. 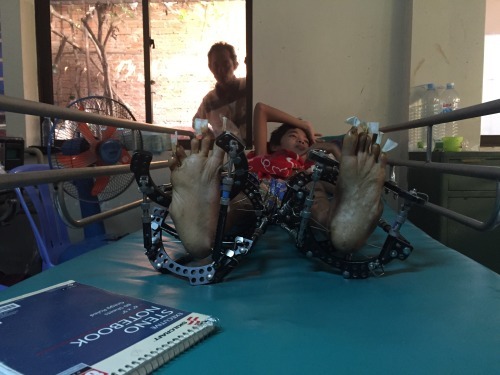 Seeing the frequency of land mine-related injuries and a prevalence of other disabilities, Dr Jim started the CSC with the aim of treating victims of land mine injuries (many of whom were children). The project evolved into the CSC that exists today – a surgical and rehabilitative center serving children and adults with physical disabilities arising from injuries, disease, or congenital defects. 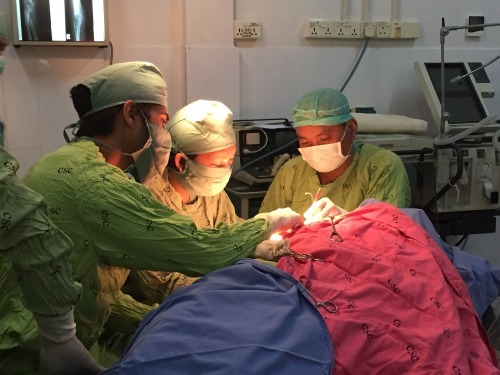 Its mission is to improve the quality of life for disabled Cambodians by providing free rehabilitative surgery, while also training local doctors and health workers. 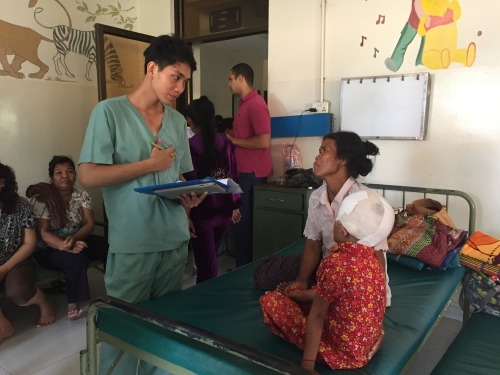 The staff consists primarily of Khmer doctors and nurses who work alongside Dr. Jim and a number of visiting doctors and medical students who come to share their expertise. The CSC is located just outside of the city center in Phnom Penh, in a modest compound that almost resembles a school. After landing we headed straight to the CSC for an afternoon tour of the facilities – the waiting areas, ear nose and throat (ENT) clinic, patient intake area, operating room, eye clinic, and adult and children’s wards. These were all housed in the Vanda Wing, which was built largely with funds raised through the Vanda Boxing White Collar Boxing events. The addition of the Vanda Wing has greatly increased the CSC’s capacity, allowing it to treat more patients than ever before. It was mostly quiet in the afternoon as most of the patients and doctors had dispersed for the day – quite the contrast to the buzz of activity we would witness the next day. 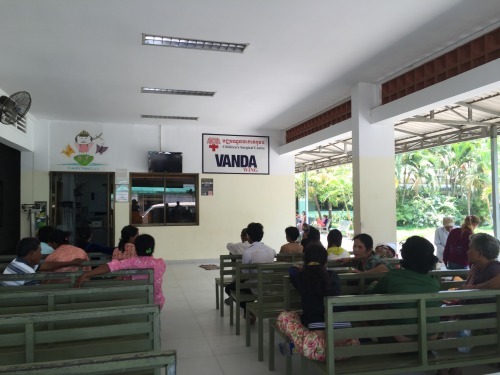 By the time we arrived at the CSC the next morning the waiting area was already starting to fill up with patients. We got ready to join the doctors and staff for the daily roundup meeting after changing into our scrubs (which comically fit better on some of us than others). 60 year old woman with a broken arm that had not healed. She could barely move her arm, and the plan was to insert some plates to allow for it to heal. A 16 year old boy and 20 year old girl with ruptured ear drums that needed repair. Both had severely impaired hearing. After the morning meeting we accompanied the doctors on their daily rounds and learned a little more about the case histories of some of the patients in the wards. Among them were a middle-aged man who was recovering from surgery on a broken hip – as we passed he cheerfully said hello and told one of the doctors he was able to sit up on his own for the first time since falling and injuring the hip. There was also a young boy who was getting his clubbed feet corrected. Upstairs in the children’s ward we met another boy who had severe burns all over his body – his forearm was almost fused to his bicep and his hand was a mass of scar tissue; he had just had a procedure done to remove the tissue that essentially fused his neck to his chest, and now he actually had a functioning neck. His arm and hand would be next and his prognosis was good – with all of the necessary surgeries he would be able to regain functionality in his arm and neck. The challenge would just be in ensuring the proper follow-up is done. With no way of tracking patients after they return to their hometowns, there is no guarantee that patients can or will return for the follow up procedures required. 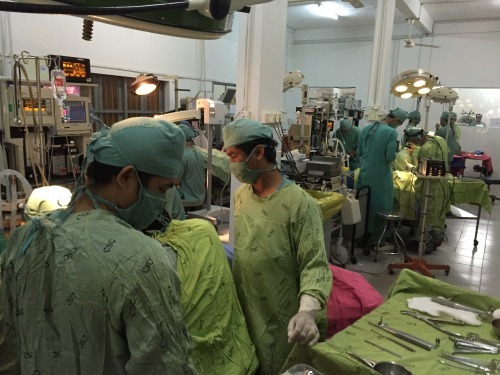 Once the rounds were done, we headed over to the operating room and scrubbed in to observe the 4 surgeries already in progress. There is only one OR, and no space is wasted – multiple procedures take place simultaneously, with patients and surgeons coming in and out efficiently as procedures stop and start. We watched as doctors cut into a woman’s arm to insert steel plates that would reset her arm. The eardrum repair, tumor removal, and finger stump revision surgeries were all taking place in the other corners of the room and we wandered between each surgery watching the surgeons at work. 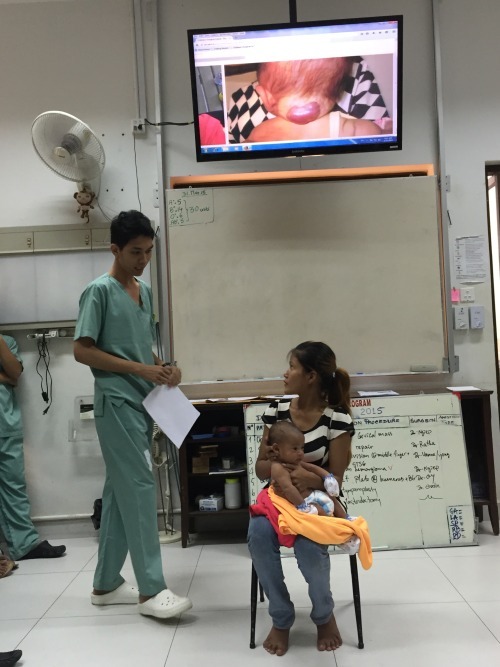 Nothing goes to waste – the most cost effective equipment/supplies are used, and Dr. Jim even watches to make sure the doctors aren’t leaving too much excess on stitches. 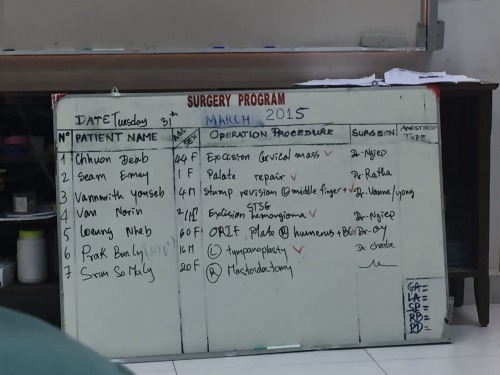 The thing that struck me most about the visit was the nature of most of the conditions and the related surgeries. Some of the most common conditions seen by the CSC include congenital defects (such as cleft palates or clubbed feet), burns, orthopedic injuries, cataracts, and damaged ear drums. In first world countries, the treatment for these conditions would be relatively straightforward and accessible. If you had a broken arm, you would get an x-ray, get the bones reset/cast, do some physio work and be ready to go again in a few months. If you had an ear infection you’d see a doctor, get some drugs, and eliminate the infection before it became a chronic condition. You’d get burns treated immediately at your local ER. 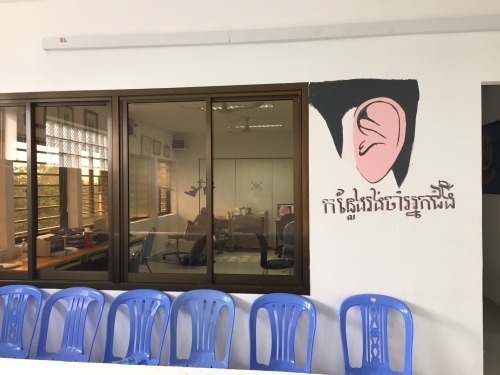 For many in Cambodia such care is not readily accessible – untreated ear infections turn into chronic conditions that result in ruptured eardrums that render people mostly deaf. Untreated breaks result in crippled limbs. Untreated cooking fire burns result in disfigurations and severe disabilities. Those with injuries or congenital defects must deal not only with the physical health issues resulting from their conditions but also the mental toll of being shunned and deprived of opportunities based on their disabilities. For those coming to the CSC, what would be seem to be a “basic” procedure can mean the difference between being disabled and unable to work and being able to recover the physical capabilities necessary to provide for themselves and their families. Seeing this firsthand made this all the more real – this is what we’re supporting with our fundraising efforts. So to everyone who has supported the cause so far, thank you! If you’d like to contribute to the CSC, you can do so through my fundraising page here.